The FS-500 offers low cost flow monitoring with a variety of switch actuation points and low pressure drop. 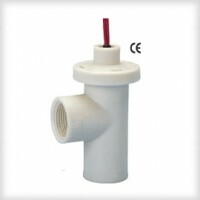 All wetted parts are polypropylene or stainless steel, making this flow switch ideal for a wide range of chemical and temperature requirements. The materials are also NSF or FDA approved for potable water treatment applications including chlorinators, purifiers and heaters. The FS-500 is ideal for equipment cooling including welders, lasers, etc. A J-box version with a 5 amp relay is also available for direct control of higher electrical loads, such as chlorinator pumps.